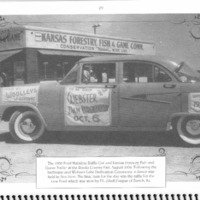 The 1956 Ford Mainline Raffle car and Kansas Forestry Fish and Game Trailer at the Rooks County Fair, August 1956. Following the barbeque and Webster Lake Dedication Ceremony, a dance was held in Stockton. The final item for the day was the raffle for the new Ford which was won by F.L. (Red) Forgue of Zurich, Ks. “Rooks County Fair,” Recollections Kansas, accessed April 21, 2019, http://recollectionsks.org/items/show/1799.